Since this blog started 13 months ago, we've worked to improve things in terms of style and content. Yes, we lost a Canadian, but we replaced him with two Americans. I'm not sure what the exchange rate was, but this has worked out so far. We've worked on some theme weeks and even have our first collection, TERMINAL DAMAGE, done and nearly ready for your reading pleasure. And now we have an improved option in terms of delivery. Sure you can read the Do Some Damage blog on the computer. But that ain't good enough for us. Now, through the magic of fairydust and cutrate pharmaceuticals, you can now get your DSD fix each morning delivered to your Kindle. Each morning at about 3 a.m. eastern time in the US of A, the blog gets updated. (Unless it's Jay's day, then, you know, eventually.) 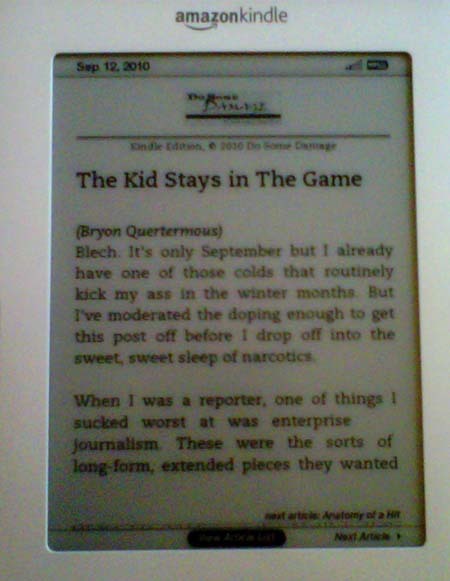 Here's what it looks like on the Kindle. The sign-up fee for this is $1.99 a month, which gets you all 30-ish posts per month. I don't know why it's that price, which is set by Amazon. Whatever portion of that money makes it from Jeff Bezos's bank account to ours will be spent on lottery scratchers and whip-it cans. 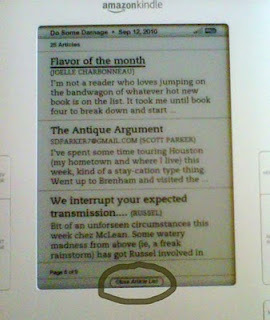 So if you subscribe to DSD on Kindle, each morning you get the DSD blog sent right to you. I've subscribed to a number of magazines and newspapers, utilizing the FREE 14-day trial option Amazon offers. I sign up for the L.A. Times for a couple of weeks and end up with screens and screens of book reviews and feature articles. Want to see whether you like the New York Times Book Review? Trial subscription. Same thing with the Do Some Damage blog. Give it a shot on the Kindle and see what you think. One of the little pieces of sweetness I like is that you get access to DSD archives. Check out the "section list" at the bottom of the screen. If you missed Russel's bookselling post or Dave's discussion of Rutgers recruiting, you can just scroll back and catch up. At first I thought that paying to subscribe to a newspaper I could get online for free was dumber than paying for water. But then I did the trial-subscription thing and understood. Delivered into your hands is pretty cool. Anyway, if you have a Kindle and want to get the blog sent to you each morning, you can click HERE for a free 14-day trial subscription. As if that ain't good enough, the DSD Podcast Season The Second -- or if you're in the Britains, Series Two -- should kick off soon. We're planning many more interviews and special guests, plus autographed photos of Jay Stringer, as those seem oddly popular now. Keep in mind that debut novels from DSD's own Joelle Charbonneau and friend-of-the-show Hilary Davidson are coming out this month. 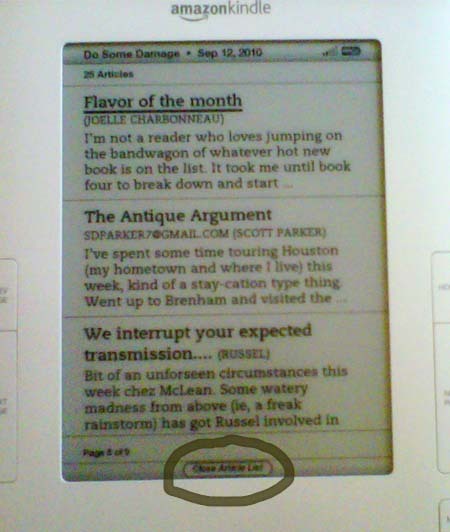 Kindle. Terminal Damage. Podcast. Debut novels. Phew. Getting kinda busy around here. See No Evil, Hear No... What?